A very special Greek-Australian family reunion is planned to be held next June by one of its descendants. 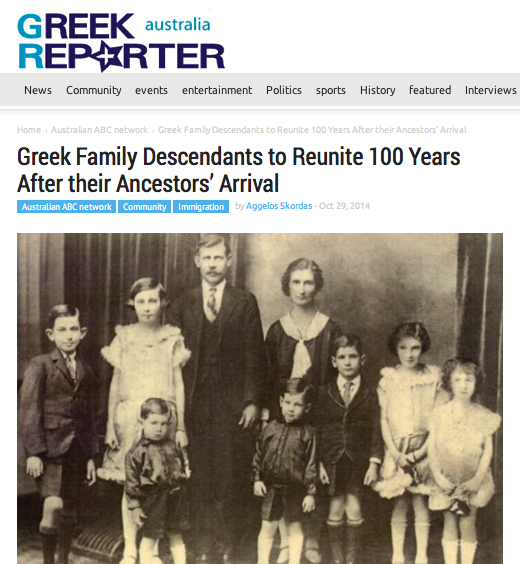 According to Helen Haritos, offspring of Eustratios Haritos, one of the first Greek migrants in the northern city of Darwin, the reunion will bring together more than 100 family members from across Australia and Greece. The Haritos family arrived in Darwin almost 100 years ago and like many Greek migrants, Eustratios Haritos was in search of work during the upheavals brought about by World War One. Along with them, almost another 1,000 Greeks reached the city between 1914 and 1919, said oral historian of the Northern Territory Archives Mathew Stevens to 105.7 ABC. “When WWI broke out and Vesty’s Meatworks was established in Darwin, there was something of a boom,” Stevens underlined. Two years after arriving in Australia, Haritos established a salt pan business in Ludmilla to supply salt to meatworks. He also married another newly arrived Greek migrant, Eleni Harmanis, in what is thought to be Darwin’s first ever traditional Greek wedding. The two-for-one wedding married both Harmanis and her sister to two ambitious workers and was performed at the old Darwin Town Hall. The newly married couple spent the next 20 years raising their family of eight children and building a life in Darwin, but the outbreak of World War Two uprooted their lives once again.